This entry was posted in Family History and tagged Lundager, photograph, Rockhampton by cassmob. Bookmark the permalink. Chris Wright may be able to help with this one… she’s with the Central Qld Family History Association. A great photo. Thanks Chris, yes I thought of her -now to go over to FB to let her know. A great photo. 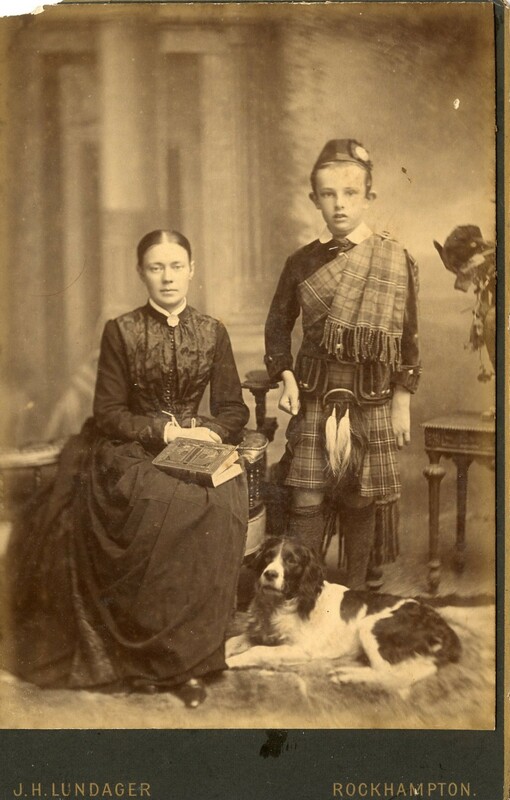 Shame it is in sepia, otherwise you would be easily able to identify the tartan. Unless you know an expert on tartans? That’s a good idea Julie, but no, all I have is a book. Maybe a family member whose tartan it is will recognise it. I would love for it to be a family photo of mine but no such luck. I am hoping you find a family for this picture so we can have the back story. Otherwise, the picture will sit in my mind — just a’waiting’. It would be great to find out wouldn’t it?